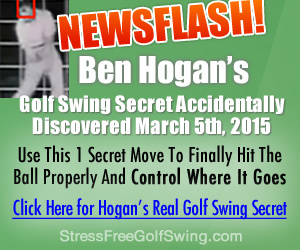 Are you interested in learning more about how to improve your golf swing? Well, it looks like you have come to the right place. In fact, for those of you who want to always play your best, the tips that many of the professional's golfers share today can endow you with customizing and grooming your own unique style. With that being said, it is important to note that both newbies and veteran golfers alike are always looking for tips, strategies, and recommendations for improving their game. So, for those of you who have an interest in learning some of the essential keys to tailoring your golf swing, here are some invaluable basic tips that you can use to become a better golfer every time. First of all, the golfer’s feet must be firmly planted on the ground prior to taking any kind of swing with the golf club. Without a firm stand, the golfer tends to oscillate back and forth from their heel to their toes. Unfortunately, when this occurs, the swing can be adversely affected in a number of different ways. Though this stance may sound easy to some, this kind of position may take a little or a lot of practice to perfect. Therefore, it is not uncommon for professionals in the industry to recommend practicing the proper balancing on a platform that is not easy to stand on securely. For instance, one great way to practice this kind of stance is to stand on the edge of the curb, especially since it requires special techniques to remain completely still and balanced at all of the times. each club is actually meant for and why. For instance, even if the player is getting started with a second-hand set, it is very important that they are considering the right swing weight. Particularly, because the swing weight will help to determine a number of different things including how the individual will need to judge its overall weight distribution. An additional factor in making the right selection will also involve making a comparison between the club's weight and the individual and their strength. Fortunately, there are quite a few great videos online to help you with making the right choice. Learning how to play golf successfully will also depend on several key factors. Therefore, everything that a golfer takes in can be used to their advantage at one point in time or another. One of the most important is learning what makes up a power swing and how to carry it out, specifically when it is really needed. So, here are some great tips in making sure you can improve your power swing when you are practicing in advance. Firstly, it is important to note that the entire upper body is required to make this kind of golf swing effectively. So, if you are in the midst of making a power swing to get the ball on the other side of the golf course, the hands and arm movements only is normally not enough. Instead, you will need to move your arms, hands, hips, legs and your waist in the appropriate direction, as you lean into hit the golf ball. All of which can help to generate enough power to move the ball where ever you want it to go with speed. Before taking the shot, there are other things that the golfer needs to know. More importantly, improving your game as a golfer usually involves learning how to concentrate and operate as calmly as possible. By being calm, you can avoid the possibilities of dealing with sweaty hands and other little irritants that can greatly affect your game. Specifically when sweaty hands and palms can result in the golf club flying out of your hands prematurely. Whatever the situation, it is very important that the golf swing is well planned out without having to over do it. As most people may know, after watching a good game of golf by the professionals, this is a game that will not only take a certain amount of skill but also patience too. While most newcomers and veteran players may feel pressured to swing at the golf ball quickly at any given time, others may know how the swiftness of responding in any game can easily compromise the success of the entire day. Therefore, if the golfer is going to do their best while they are preparing to swing at the golf ball, they will need to learn how to pace the swing appropriately. Meaning you should make sure that you are resisting any of the strong urges that make you feel like you want to swing hard every time. Learning how to improve your golf swing can be a very challenging undertaking. However, when the golfer knows how to follow some of the best tips and strategies that many of the best professionals provide, each individual will have an opportunity to coin their skills in a strategic manner. Starting with learning how to maximize the control of their golf swing by standing firm without oscillating back and forth to understanding what movements are actually needed to produce a successful power swing, there are a number of different key strategies that can be used to improve your golf swing. Specifically, if you to want to progress quickly as you perfect your own craft.